Province 1 contributes the highest number of migrant workers for foreign jobs, among all provinces in Nepal, according to a report on labour migration. It ranks number one for the last nine years, sending 25.51 percent foreign workers from fiscal year 2008-09 to 2016-17. Province 2, that has eight districts, comes second with 24.10 percent of the total labour permits issued. Province 5 and Province 3 rank third and fourth with 16.26 percent and 16.07 per cent. The Department of Foreign Employment (DoFE) issued over 3.5 million work-permits during this nine-year period. The third edition of the labour report lists migrant workers’ data of each province for the first time. The Ministry of Labour, Employment and Social Security, jointly prepared the report with IOM, the UN Migration Agency, the International Labour Organization (ILO) and The Asia Foundation. 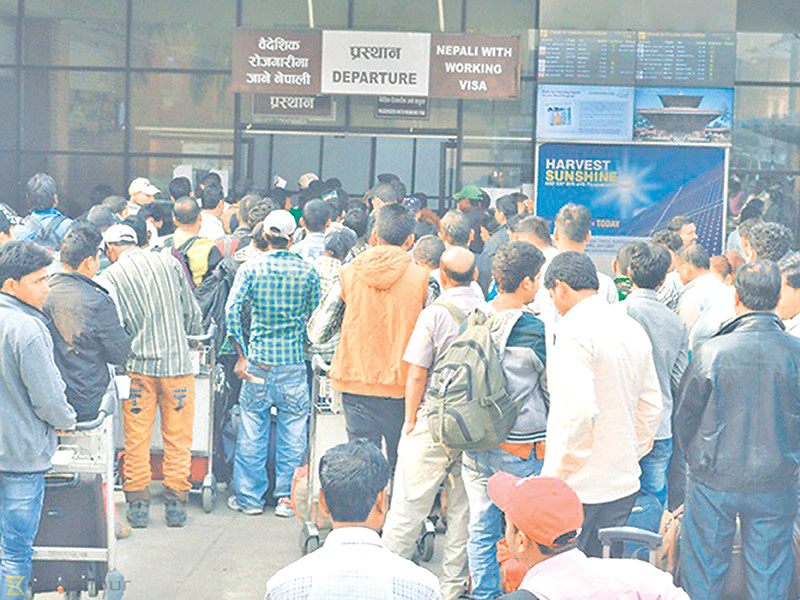 The report, first published in 2014, shows workers from Tarai districts migrate to foreign countries in large numbers, like previous years. “The majority of migrant workers came from the South-Eastern plains of Nepal,” the report says. The top ten districts of southern plains accounted for 34.64 percent of all migrant workers in the past nine years. Nepal’s top ten recipients of labour permits districts are:- Dhanusa, Jhapa, Mahottari, Morang, Siraha, Saptari, Nawalparasi, Sunsari, Sarlahi and Rupandehi. Dhanusha district issued 5.16 percent work permits, followed by Jhapa 4.48 per cent, Mahottari 4.40 per cent, Morang 4.10 per cent, and Siraha 3.97 per cent. The remaining 65 districts supplied 63.35 percent in the last nine years. The Centre for the Study of Labour and Mobility researcher Arjun Kharel says one should analyse these statistics in relation to the proportion of population of these districts and provinces. “The data taken from DoFE record shows the number of workers migrating through proper channels, it excludes a large number of workers migrating to India. “This data has a drawback since it counts work permits and not the exact number of migrant workers travelling abroad. The data includes the same person repeatedly if he returns and again takes up foreign employment,” says Kharel. According to the report, the HDI value for Nepal in 2011 was 0.490 with Kathmandu valley region having the highest HDI of 0.622. “Poverty and unemployment in the western hills and the southern plain districts is higher compared to other areas. Poverty cannot be the main factor while analysing people migrating for employment. This also depends upon their social networking, and how easy it is for them for migrate abroad for jobs. Many go abroad as their family members and friends are already there,” says Kharel. The lowest share of migrant workers is from the mountainous districts, such as Humla, Mugu, Dolpa, Mustang, and Manang, the report says.